I’m so excited, you guys. My fourth little one is actually school age. Where did time go? I get to do Kindergarten all over again. As I was contemplating how I was going to teach him along with his siblings, I started to get nervous. 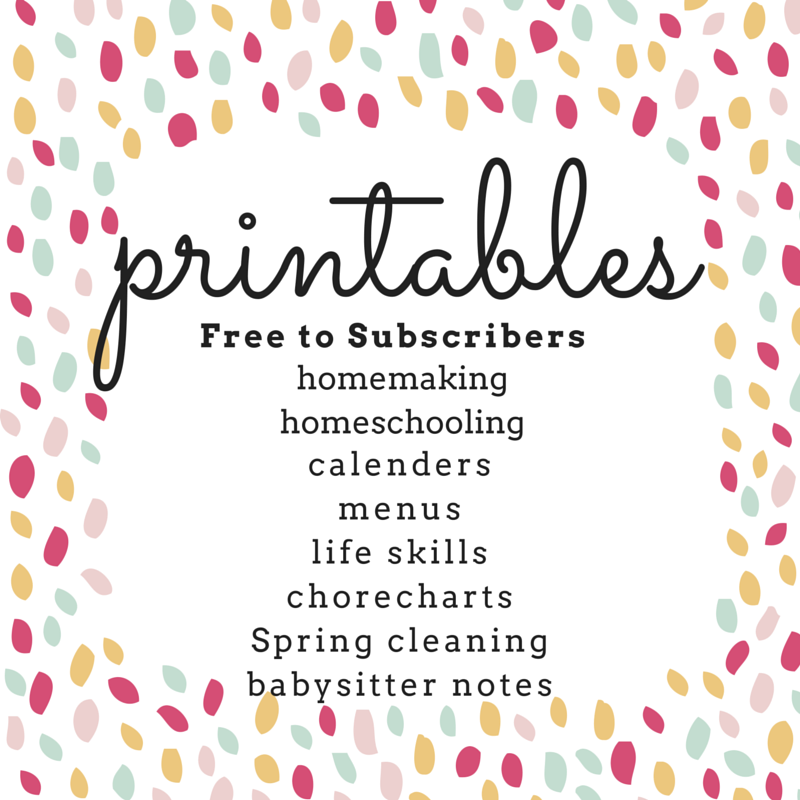 All kids are different and each one learns at their own speed – this I know from homeschooling for going almost 7 years… however, my son was struggling, at the age of 5.5, to know his ABCs. As I was searching for curriculum for his Kindergarten year, I stumbled upon this phonics program. I can’t wait to share about this awesome curriculum with you all. My son and I are moving quickly through book 1 this summer, we’ll be ready to start book 2 of Jolly Phonics and Grammar from jollyliteracy.com sometime in the fall! Jolly Phonics, which is from jollyliteracy.com and just2ducks LLC, is a SUPER EASY phonics and grammar program for children. 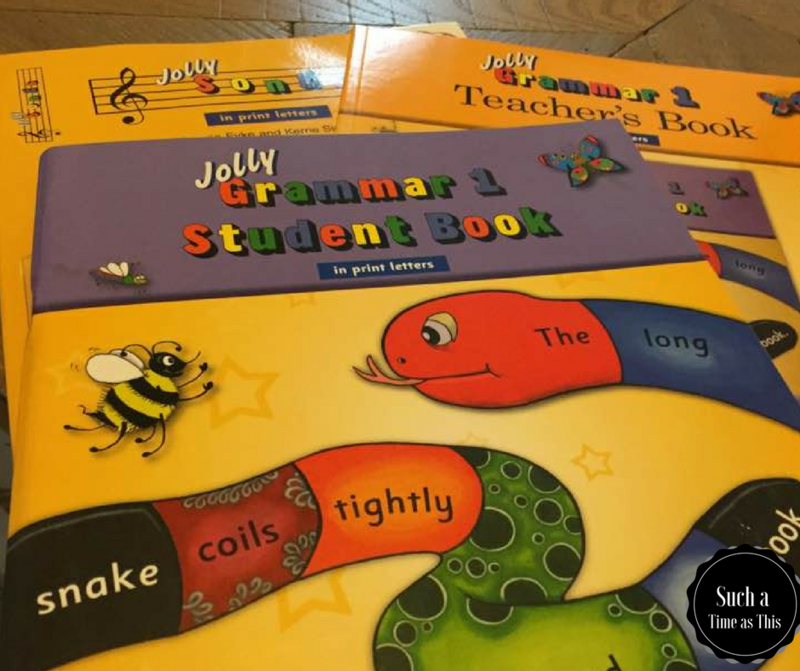 We received the set of all three Jolly Phonics Student Books, the teacher guide, and the Grammar 1 workbook, teacher book, and Jolly Songs. First, let me just say how impressed I am by this program. 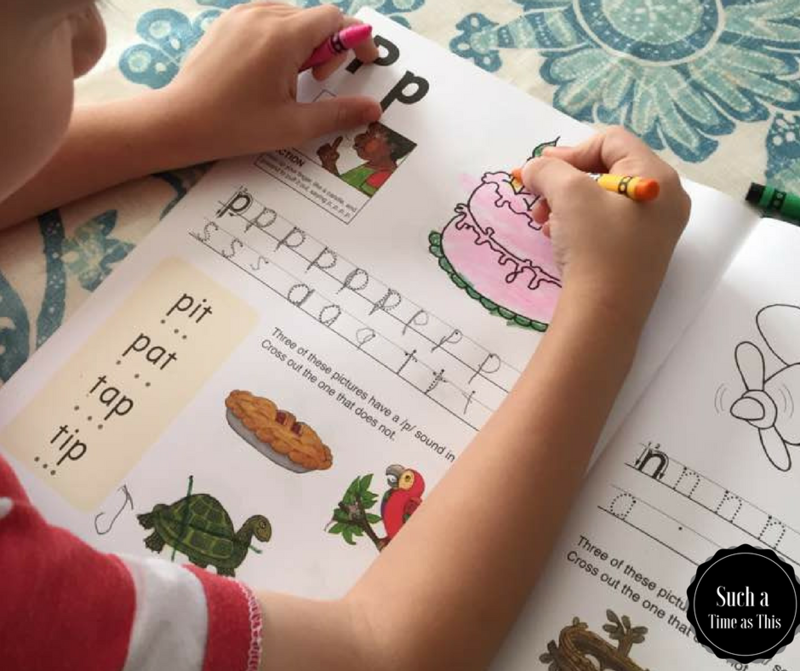 When I found out about Jolly Phonics I was kind of in a panic about which program to use for our 5.5-year-old. He was struggling to know his letters (only knew a handful) and I wasn’t sure if he was ready or not for a formal phonics curriculum. The teacher book gives helpful advice for teaching phonics to young kids – and for general use of their program. 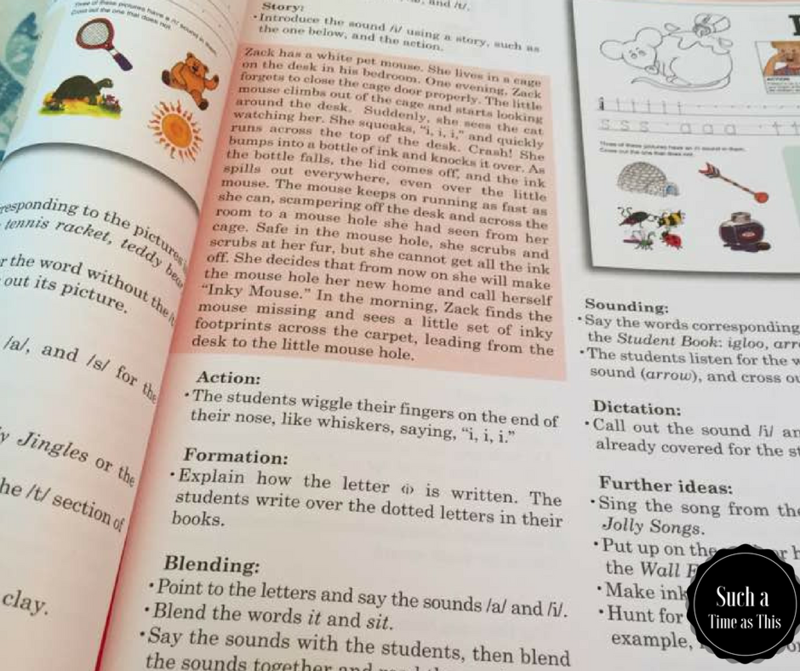 The first phonics book consists of one page a day for students. There is also more info on how to teach the lesson in the teacher book. I use this as a guide. The teacher book mentions letters we are to review and the story to be read. Wooh! That sounds like a lot but trust me it is short and to the point…which is just what we all needed. The story is very short and is meant for the teacher to read directly to the student. The story stresses the new letter sound by using many words that start with the letter. After I read the story, I show Mr. D (our 5-year-old) the hand motion which directly goes with the story in some way. We practice the hand motion for a minute and then I show him how to write the letter by “air writing” the letter with my finger. He then picks up his pencil and tries to write it himself by following the pre-filled in line. There are usually three or four words to practice blending which I have been helping him with. He is pretty new to blending, so this has been trying for him. I’m glad there are only a few words each day. He feels so happy when he completes that section. There is also a small section at the bottom of the page with four pictures. Three of them contain the new letter sound and one does not. It is his job to cross out the word that is out of place. Lastly, he colors the picture which matches the story and hand motion. 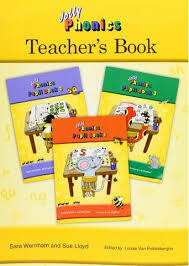 The phonics program consists of three student books and one teacher book. The first book, which we are still working through contains all the letter sounds including “helper” sound and blends. It contains the long O made up of oa, the long I made up on ie, the sounds of oo, ee, ch and sh, oi, ou, er and more! The second and third book contain a slightly different format than book one. Book two features writing words, identifying correct spelling and reading short phrases. Book 3 contains more reading and writing sentences. However, although the formats are different from book one, each book contains beautifully drawn colorful pictures and fun activities for the students. 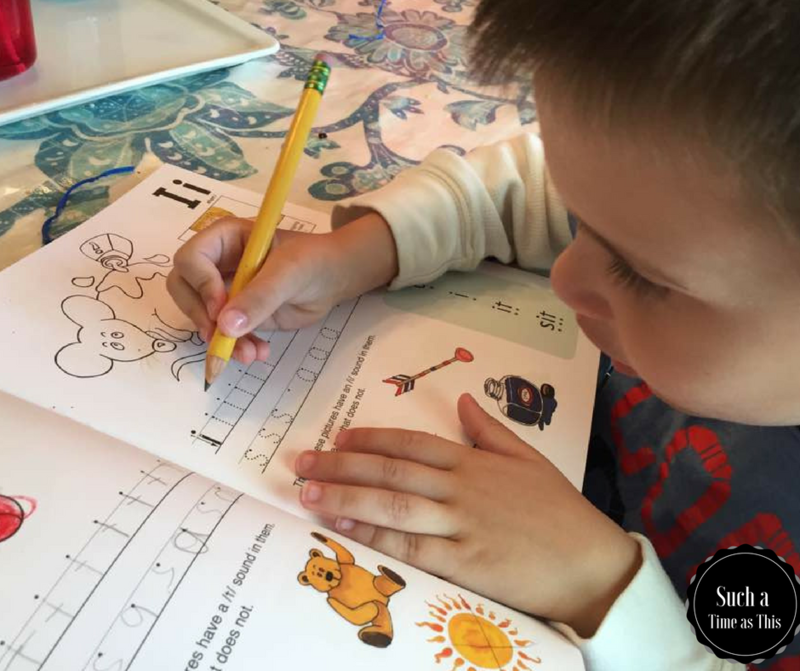 These books are meant to be worked through during either preschool or kindergarten. Grammar 1 is geared toward first grade and is meant to be started after completion of the phonics program. The curriculum covers both grammar and spelling and delves deeper into concepts which were touched upon by the earlier phonics books. This looks like a very good program for covering beginning grammar. I really wish I had known about this program when my older kids were younger. There is some great content in this book and it is laid out so nicely! I’m really excited to move through the rest of this phonics and grammar program with jollyliteracy.com. It seems like the perfect curriculum for my active little guy. He loves “doing school” but is still a bit wiggly, so I strive to keep his lessons short. 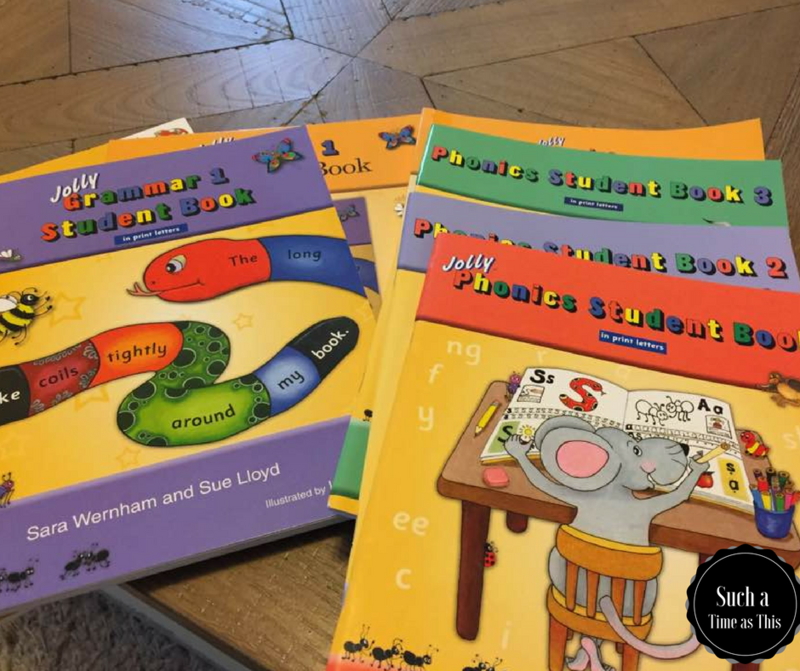 Jolly Phonics has created a way to squeeze a lot into each short lesson – no busy work, no extra stuff. It is just enough for our Kindergarten year. How awesome that this program came along for him at just the right time. Looks like he is doing well with it. 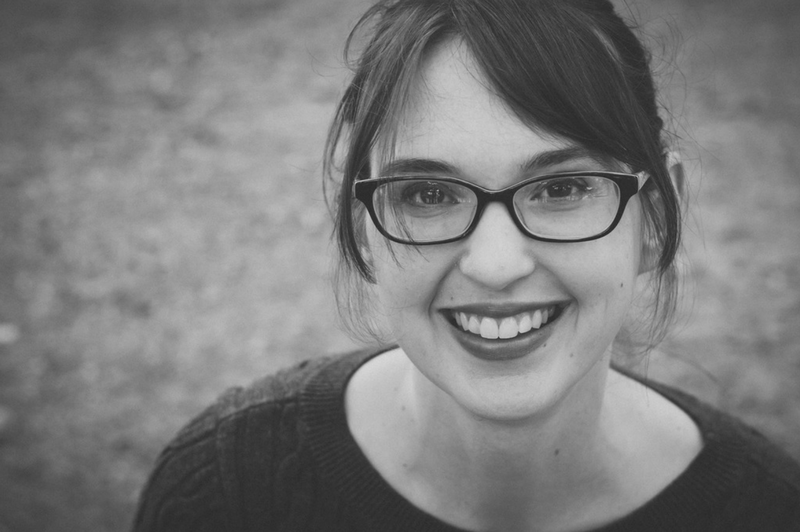 Lori – I know! We both love it so much!